1 Author and playwright Anton Chekhov was a gifted writer who didn't always look back upon his childhood with fond memories. He was often too busy working for his father to consider what he wanted to accomplish in his future. However, when Chekhov eventually realized he had a talent for writing, nothing stood in the way, not even his career as a doctor. 2 Chekhov was born on January 17, 1860, in Taganrog, a sea port located in southern Russia. His father, Pavel Egorovich Chekhov, was a grocery store owner who married a merchant's daughter. The two of them had six children; Anton was the third child. The family tried to survive during difficult times, so once they reached a certain age, all the children worked in the grocery store. During the summers, however, young Anton enjoyed spending some of his time at his grandfather's home, fishing and sowing the seeds in the ground with a love and respect for nature that he kept all his life. Home life was difficult for Anton. Although very religious, his father was also very abusive. Anton did like to get away and spend time with the working people and peasants as they played games and laughed. Anton's mother told wonderful stories. Eventually Anton's father went bankrupt, so he moved the family to Moscow in order to avoid debtor's prison. 3 While his family lived in Moscow, Anton was left behind in order to finish his schooling. He no longer had to work in his father's shop, so he was able to spend more time on his studies. Anton began to excel in his education. He soon realized he had a gift for writing. At the age of seventeen, Anton wrote a long tragedy. Bits of wit were already present in his writing. 4 After completing his schooling, Anton Chekhov rejoined his family in Moscow and was able to be admitted into medical school. In order to help with expenses, he wrote daily sketches about Russian life on the streets. Chekhov soon developed a reputation. His first short story was published in 1880. 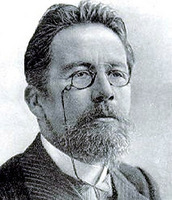 Chekhov published most of these early stories under the name Antosha Chekhonte. In 1881 additional stories were published in the Alarm Clock and the Spectator. Chekhov published his first book, The Tales of Melpomene, in 1884. Published with his money, The Tales of Melpomene is a collection of six humor pieces. The writings contain both enthusiasm and wit.